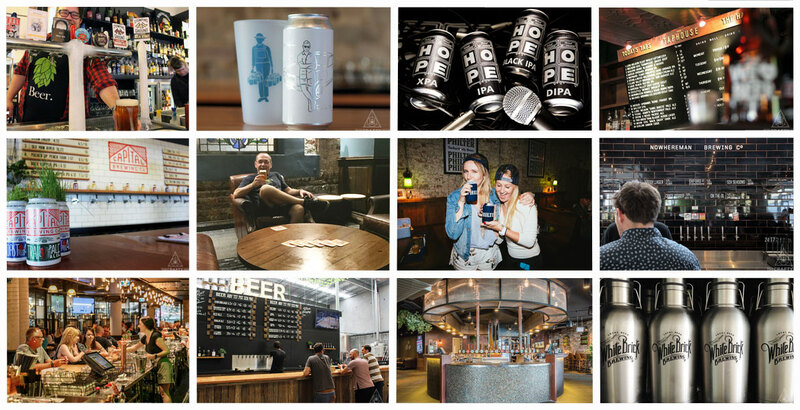 Whenever we've added another dozen brewery, venue and bottleshop listings to the directory, we round them all up in one place in case readers missed them when they were posted first time around. After a recent flurry of new additions, we've got a little ahead – or behind – of ourselves, with CoConspirators making it 13 since the last roundup (and Rocky Ridge following later today). So, without further ado, another montage photo and another lineup of 12 breweries and venues playing their part in changing the country's beer culture, from Brisbane to Belmont and Perth to the Peninsula. You'll find them all, plus hundreds of others, in the directory and in the Crafty Recommends map (at least those with a physical address). And, in a few days, you'll have them at your fingertips too with the launch of a new Crafty Pint app. Helsby's Ale House (QLD) – The latest reinvention of one of Brisbane's iconic old hotels saw the family behind The Pineapple Hotel welcome back an old staff member – one who's something of a legend in beer circles – to oversee the creation of a new craft beer venue. Pop into Helsby's and you'll find Les, 16 rotating taps with a strong focus on local, fine food and a lot of pineapples. Philter Brewing (NSW) – Sydney based gypsy operation Philter burst onto the scene rather quickly after collecting the Champion Pale Ale trophy at the 2017 Craft Beer Awards just months after releasing said beer, its XPA. Overseeing brewing is Sam Füss, who's previously worked for the likes of Young Henrys and Little Creatures, while the brand's fondness for an aesthetic likened to Nascar and Peter Stuyvesant durry packets has helped catch eyes too. Whitfords Brewing Company (WA) – The second brewpub venture from the team behind Beerland beers and the Northbridge Brewing Company saw them set up home in a new shopping centre several dozen kilometres north of Perth's CBD. It might not seem the likeliest of locations, but it's brought water (well, craft beer) to what was previously an area lacking a local brewery, with the team them knocking out regular limited run beers as well as Beerland's approachable core range. Edge Brewing Project (VIC) – Another gypsy operation and another that has trophy success too – most often internationally, with its sole core beer, Cool Hops lager, amassing most of its silverware. Founder Adam Betts says he's a brewer of lagers, sours and stouts, has collaborated with some of the finest brewers in the world – often on their home turf, and plans to find a location for a barrel room and venue to give Edge a home that's open to the public. Captain Melville (VIC) – Its home is one of the oldest pubs in Melbourne and its name is taken from Francis Melville, a bushranger who pretended to be a gentleman while holding up coaches from the goldfields. Today it's a pub with 14 taps pouring local crafties and that takes its food as seriously as is beer, while upstairs you'll find late night cocktail bar Lock & Key too. White Brick Brewing (QLD) – The beer scene in and around Brisbane is expanding at a phenomenal pace, with new breweries opening pretty much monthly. Among the more recent arrivals is White Brick, conceived and built by NOrth Lakes resident and beer lover Adam Gibb as a means of give his part of the world in Brisbane's northern suburbs a local brewery (and venue) to call their own. Bucket Boys Brewing (NSW) – "There was an old lady who swallowed a fly..." In trying to capture the essence of Bucket Boys – now bottleshop, bar, distributor and brewing company, Nick Oscilowski lent upon the absurd classic and the concept of beer business as record producer. Capital Brewing Co (ACT) – Prior to BentSpoke opening in 2014, there had been little change in the capital's beer scene. But things have been moving fast since, helped in no small part by the arrival of Capital Brewing Co. The team wasted little time getting its beers into venues along the East Coast and has since launched a core range in cans while also landed three of them in the most recent GABS Hottest 100 Aussie Craft Beers poll. Your best option, however, is to take yourself to the brewery's impressive home in Fyshwick. Nowhereman Brewing Co (WA) – It took him far longer than he'd planned or, indeed, hoped, but in the second half of 2017, Reece Wheadon finally opened the doors of Nowhereman, a brewpub in the popular Perth suburb of West Leederville. It's been worth the wait, with its home a fine reworking of a former furniture factory, refined beers from former Monk and Colonial brewer Paul Wyman on top and top quality food completing the picture. Boat Shed Bar + Galley (NSW) – Pull up your yacht and step inside for an epic burger washed down with a local beer or three... Boat Shed Bar + Galley boasts one of the more picturesque outlooks among Aussie craft beer venues – looking out over Lake Macquarie from its home within the Belmont 16s Sailing Club – and has most of its taps rotating through Aussie brewers, typically those found within 100km of the bar. Mr Banks (VIC) – The brewery with a name taken from the family dog, which was originally taken from a character in The Mighty Ducks launched as a pretty small affair with a tiny tasting room in a Seaford industrial estate. It's rather bigger now, having expanded both its brewery and its venue considerably. Head along to the family-friendly space – complete with basketball hoop, couches and Frosty Fruits – or keep an eye out for the ever-growing lineup of colourful cans.